like many teenage boys, prior to being able to drive, i had a fascination with motor cars. such a fascination is mostly devoid of any notion of the expense involved in maintaining even a modest runabout, bought through a classified ads in the local paper. i passed my driving test mere days before i headed off for a few years at art college, and though i can't say i starved on my student grant, it certainly did not extend as far as owning a motor car to get self and colleagues to and from college. however, during the holidays i managed almost exclusive use of my mother's dark blue mini clubman (in the days when minis were still mini). it turns out that a five piece drumset fitted just dinky-doo. despite my continuing student status, i made sure i was a responsible child and paid for any petrol used while scooting hither and thither even harbouring thoughts of being able to perform some routine maintenance on the vehicle due to my superior mechanical knowledge. this would have been all the more laudable had i actually possessed the superior mechanical knowledge of which i speak. naturally enough, i'd bought the appropriate haynes manual and got as far as removing the top of the air filter to take a peek inside the carburettor, and even removed more than one spark plug for no other reason than the fact that i could. i could check the oil level once a week, inflate the tyres to the recommended pressures and top up the radiator and screen wash perhaps a tad more often than was strictly necessary. but, if push came to shove and a hitherto unnoticed noise appeared in the course of my travels, there was no other resort but to hand it into the local garage; i did warn you about my lack of mechanical skills. those days, thankfully, are long behind me, but even when i possessed my own cars, the first port of call for maintenance would always be a bona-fide motor garage. despite being still convinced that i had the infernal combustion engine sussed, confidence in my ability to carry out any repairs was minimal to say the least. however, bicycles are a whole different bucket of cartridge bearings. i know how to fix those. i have made previous mention of the knowledge that were i to be in the business of building bicycle frames, i would stand back to admire my handiwork and put the flame through one of the gas hoses. that's precisely why i have never even attempted to build a bicycle frame and nor will i. wheels, however, are a completely different matter; those i can build, and apparently quite well according to the mighty dave t. but my abilities in this field come under the heading of one size fits all; i can build you a pair of wheels, and they'l ride and last pretty well, but why, i have no idea. and i'd be inclined to build the same set of wheels for each individual no matter their style of riding or physical constitution. that hardly encompasses the very reasons you'd spend money on a pair of handbuilt wheels as opposed to a pair of factory-builds. happily, my building of wheels is very infrequent and not something on which i depend to keep the wolf from the door. there are others, however, far better qualified in the field of wheelbuilding who make me look like the rank amateur that i and many others truly are. jude kirstein in portland is definitely one, but far closer to home, derek mclay of wheelsmith in larbert, scotland is another. i've had the very good fortune to spend over a year riding a wheelsmith race 23 wheelset, and currently have a race 24 wheelset gracing my ibis hakkalugi 'cross bike. both sets have yet to see a spoke key since they left derek's deft skills. but not simply content to lock himself in his own workshop for the benefit of his satisfied customers, derek recently took over steven shand's workshop in houston industrial estate, livingston near edinburgh, for two saturdays, to instruct others on the intricacies of his art. 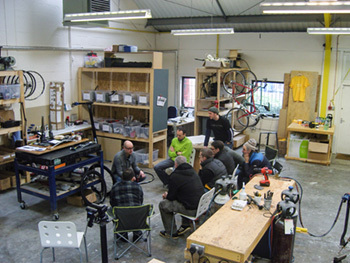 though larbert isn't too far from livingston, why did he occupy shand cycles' space rather than his own for the workshops? was it simply a case of more space? "Yes. Steven's workshop is a grand old space. There was some time at the start and end of the course and also at coffee breaks where those attending could browse and see his framebuiding processes in action. My workshop is a purpose built, low emissions log cabin and really only has enough space for three or four people. There are plenty of venues around that I could use in the future though, but this would depend on the level of interest and type of course." at the end of october, i commenced teaching my fifth photoshop course at the local further education college, instructing apparently eager individuals on the arcane benefits of layers, selections, masks and colour modes. i have spent a large proportion of my islay working career deep in the innards of the software and consider myself a black belt in nearly all aspects of its operation. it's really not that complicated a programme, but it does take a substantial period of time to learn the ins and outs sufficiently well to practice at a professional level. with this in mind, was derek at all worried that some of his pupils would turn out to be really good and divest him of even a modest proprtion of his business? "Ha ha. Well, I was hoping that the pupils would be really good, but it's not really a business that can be totally given away in five hours of tuition. On the contrary, I was hoping that I could try and reinforce the merits of handbuilt wheels and dismiss any fears anyone had of tackling routine repair and maintenance on their existing wheels. This may lead to orders, or it may simply make people more confident in buying handbuilt wheels. I was also hoping that some of the guys had read a book or two on the subject and that the course would help bring that to life. For a couple of them, I think that was the case." i have, on more than one occasion, been brought a bicycle wheel on which the owner has already (mal)practised a certain level of remedial effort. in most cases, it would have been a lot simpler for them to have brought me the wheel prior to such action, since an innocent wielding possibly the wrong size spoke key on the wrong spokes can wreak untold havoc on a formerly reasonable bicycle wheel. what does derek find are the most common misconceptions regarding wheelbuilding? "The main one is that it is a 'black art'. The mystery in wheelbuilding lies in technique, practice, patience, drive, and varying scales of evolving expectation based on these attributes. Too many people start with too difficult a job and it either puts them off, or they just tell forum subscribers that because they couldn't do it, the components are useless. Like a bad workman blaming his tools.
. "The other misconception is that you can build different levels of 'comfort' into your wheels by simply varying the spoke tensions. The spoke tensions for each given wheel design have to be spot on, or the wheels simply won't work properly. Your weight is supported by the upper spokes and compresses the rim at the road area so 'comfort' comes from the type of rim, type of tyre and the tyre pressure. Also, it is under-tensioned spokes which tend to snap and lead to hub breakages. Over-tensioned wheels don't go far; the whole wheel will be unstable." having spoken to both derek and to portland's jude kirstein, i can attest to their expertise and encyclopaedic knowledge of their craft. but as exemplified by many, knowing much about a subject doesn't always qualify the individual to pass on that knowledge in a constructive fashion. 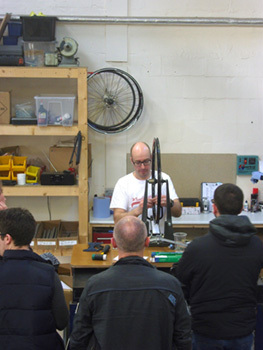 for the two workshops at shand cycles (16 and 23 november), what was the format? "We went through the history of wheelbuilding in my family and how Wheelsmith started. 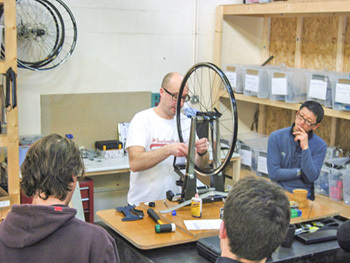 Then straight into 'the wheel' with some basic principles addressed, such as tools required and tips on determining spoke length for a given rim/hub combination. Different spoke patterns were explained along with their strengths and weaknesses. While building a radial patterned front wheel, there was time to speak about the merits of rim design old and new and how dynamically different things are nowadays. 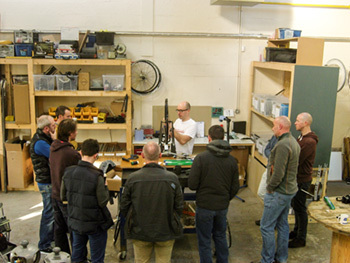 "On both days I sensed that not everyone was there to build wheels; rather it was a 'day out' and they may become Wheelsmith customers in the future, so I did try to explain my favourite components and why I choose them and not labour the technical points. The radially laced wheel was explained and put aside, then we built a two cross pattern wheel, followed by a three cross pattern on a 'traditional' rear sprint rim. On each wheel, i explained a simple technique to determine if the spoke length was correct before completing the lacing process. After a ciabatta/panini/choccie-biscuits lunch and coffee, the 2x and 3x wheels were completed on the jig. "The basic principles of checking roundness, trueness and dish were explained and then questions started to be fired in my direction at this point and the guys seemed really interested. After the wheels were taken to near completion I tried to impart my knowledge on the subject of wheelbuilding 'myths', because as in my answer to your previous question, there is a lot of forum-derived misinformation around. It'' easy to be taken in by this and I tried to dismiss the irrelevant stuff and get the guys to take a more pragmatic view on the form and function of handbuilt wheels, not getting carried away with academic over-analysing." 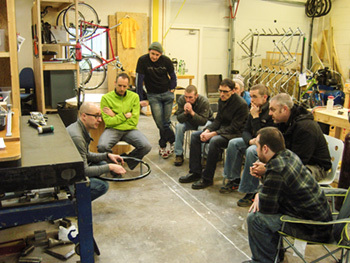 those of you who have long harboured a desire to learn how bicycle wheels are built, even if not going so far as to doing so individually, are maybe kicking yourselves for having missed these two workshops. in which case, will derek be repeating the events anytime soon? "Possibly. I found it quite difficult to get as much information into four or five hours for people of all levels of interest or ability. To get someone to be able to build a wheel and take it to completion requires one-to-one tuition and about four days. So if there was a demand for that, I could do so in the Wheelsmith workshop here.
. "I am about half way through writing a book on the subject. It will be a kind of 'layman's guide', a ground-up, simple to understand manual, spiral bound so you can lay it flat on your bedside table while doing a little spoke lacing each evening. Just what I would have loved when I was eight years old. if this is the sort of thing you might fancy, perhaps you could either follow derek on twitter (@wheelsmith) or keep an eye on the wheelsmith website in case derek decides to do it again.